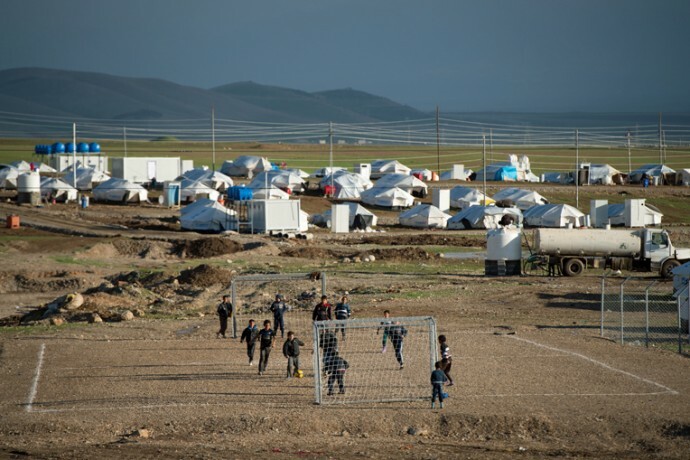 Through his connection with Samaritan’s Purse a soccer coach involved his first through third grade team in sending soccer balls to Syrian refugees. Soon after, he had the opportunity to send shoeboxes to the same kids. Brian James is an Upward soccer coach in North Carolina. His sister-in-law worked with Samaritan’s Purse in northern Iraq and helped him bless Syrian refugees. I’m a soccer coach for Upward, a Christian sports league where building character, faith, and athletic skills are the primary focus. In the fall of 2013, I was in the middle of my third season with the Upward Falcons when my sister-in-law, Hallie, let me know that she was headed to northern Iraq to work with Syrian refugees with Samaritan’s Purse. I was a bit shocked and concerned for her. Based on news reports, northern Iraq doesn’t seem like a hospitable place. But Hallie didn’t seem overly concerned, so our family quickly jumped on the bandwagon. 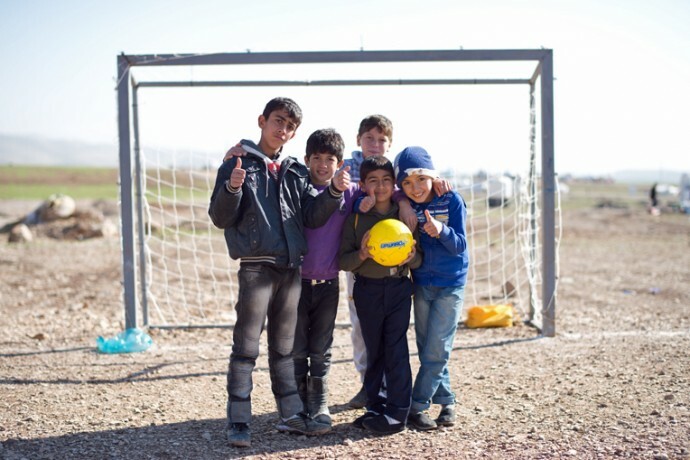 A soccer field is one of many additions to Arbat Camp to make the situation more livable for children. “The internal conflict in Syria is now in its third year. Due to escalating violence and a lack of basic survival needs, hundreds of thousands of people, mostly women and children, have fled to northern Iraq and settled into the camps and surrounding communities. More than 46,000 Syrian refugees have arrived in the region since Thursday, August 15, 2013. Based on a Level 1 registration report by UNHCR, 3,200 individuals were present at Arbat Camp outside of Sulaimani. In the Arbat Camp, 200 children are under age 5 and 350 are between the ages of 5 and 17. It was at that moment that I felt the Holy Spirit impress upon my heart the idea of sending soccer balls to Camp Arbat. I would send eight balls, one representing each member of our soccer team. As a coach, I’ve seen the power of a single soccer ball and a group of kids. They can literally run around for hours chasing each other and that silly ball. Although the gift might seem trivial considering the magnitude of the concerns in that area of the world, it felt perfect. I began by sending an email to Upward, outlining the mission of Samaritan’s Purse and asking if they could sell me the balls at a reasonable price. Later that afternoon, I received an encouraging email from Upward that said they did have balls available for purchase. All of the first through third graders on Brian’s team wanted to give soccer balls to the Syrian children. Later that week, I sat down with my team and described the issue in Syria. I showed them pictures of the camp and some of the children and explained how they had to leave their homes and most of their belongings in Syria to escape the war. They were deeply moved, and we prayed for the children at Camp Arbat. I asked the team if they wanted to help by sending the kids some soccer balls, and they all agreed. After practice, I shared the idea with their parents and asked them to contribute if possible toward the balls and some pumps and needles. The last thing we wanted was a bunch of flat balls showing up at the camp! At this point, the team was involved and the balls were attainable, but how could we get them there? On the mission statement it mentioned the Samaritan’s Purse project managers and shared their email addresses. I didn’t want to stress Hallie with the idea, so I carefully crafted an email to Samaritan’s Purse. I explained that my team would like to donate some soccer balls to the camp, and I thought the kids on my team would grow from seeing this ministry opportunity come to fruition. I asked for help in figuring out how to get our gift to the children at the camp. Again we were met with good news. One regional manager was moved by the idea and helped us figure out a solution. When compressed, the balls wouldn’t take up much space, and Samaritan’s Purse just happened to have a team member headed to the camp. That person agreed to take the balls. God was paving the way for this to really happen. 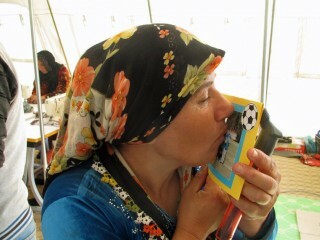 Shukreea was so grateful that she kissed the photo of the team that Brian included in her son’s box. We quickly purchased and assembled the balls, pumps, and needles and took a photo of our team with the gifts. My wife made a beautiful card for the Falcons to sign, and we prayed one last time for safe travels for the gear and the carrier. I was still a bit ashamed of the gift. What would a few soccer balls really mean to a huge camp with a ton of kids? But we had solace in how fluidly things were going, and we knew the gift was going to make the days of at least eight children. On December 1, we received an email from Hallie. The balls had arrived and been distributed to the children of the workers in the sewing tent that Samaritan’s Purse had built. 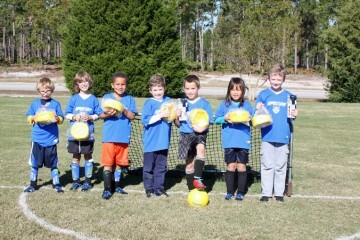 Hallie did an amazing job of documenting the gift with pictures of each child and their shiny new soccer balls. It is extraordinarily rare to see a gift like this received, but Hallie’s description and the pictures made us feel as if we were actually there. The picture of the mother kissing the card we sent was priceless! I excitedly forwarded Hallie’s heartfelt email to the Falcons, who had just completed their season a couple of weeks earlier. After sending the email, I felt we’d answered the Holy Spirit’s call. Mission accomplished. But that was not the case. The Upward Falcons had finished their season just before Thanksgiving, our soccer ball gift had been delivered to Camp Arbat, my sister-in-law had returned to the U.S., and life was progressing as usual. We had no idea that the Holy Spirit was preparing another Camp Arbat challenge. The second week in January, we received a call from Hallie. She asked if we would consider sending Operation Christmas Child shoeboxes to the same children who received the soccer balls. Samaritan’s Purse had planned a distribution at the camp that would happen soon. My immediate thought was that the season had been over for two months, and I didn’t know if I would be able to get in touch with all the team members. 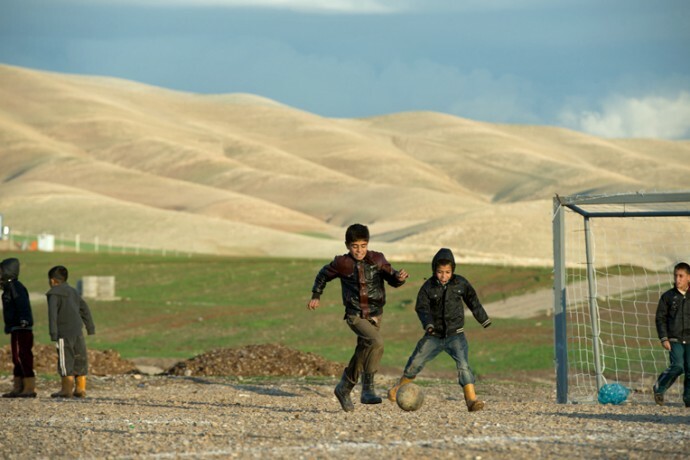 Despite the cold, Syrian children have been playing soccer since the field was built. But my wife and I have prepared Samaritan’s Purse shoeboxes as far back as we can remember, and there was no way we were going to pass up this opportunity to touch these children’s lives one more time. So we responded that we would like to do the shoeboxes and waited on further instructions. We heard nothing for a few days. We wondered if we had missed the opportunity or if Samaritan’s Purse had changed its mind about facilitating the delivery. While we waited to hear back, I prayed and brainstormed for ideas of things we could put in the boxes. I thought it needed to be fun and soccer-related, and it would really be great to pull back in the members of my soccer team to participate. On a Sunday morning in mid-January, Hallie received a response from Samaritan’s Purse. We had to have the boxes ready in two days, and I wondered if it was even possible. But God had already blazed the trail. He immediately gave me an idea for the perfect shoebox gift, a gift that was soccer-related and would allow members of my team to participate. What if we sent the kids at Camp Arbat our Upward soccer jerseys and some shin guards? The Upward jerseys are shockingly nice, and over the course of an entire season they are only worn eight times. They are like new at the end of the season. They also have the unique feature of being reversible, so it’s like having two jerseys in one. My wife contacted two of our fellow church members who do extensive work with shoeboxes in our region. They just happened to have the boxes that we needed, and they had some left over shoebox supplies to kick-start the box stuffing process. It was clear that God was going to bless this project, and it wasn’t even mid-morning yet. In just one afternoon, Brian and his team were able to pack shoeboxes for all the children who had received soccer balls months earlier. Once at church, I quickly found our Upward league commissioner in his Sunday school class and asked him if he had any soccer gear left over from last season. Next I found a couple of other coaches, and I shared the plan with them. Immediately they were engaged and helped find the much needed gear. When I got home from church, I sent an email to the entire Upward soccer league and told them I had a way to recycle their jerseys. Sunday afternoon was a blur for our family. Time was spent collecting the items to stuff the boxes, driving to pick up jerseys, creating cards to go in the boxes, and packing the boxes as full as possible. Children who gave a jersey were given the opportunity to make their own decision. It was precious to see the children’s loving response. In the end we had the eight jerseys we needed plus five additional that we threw in for good measure. 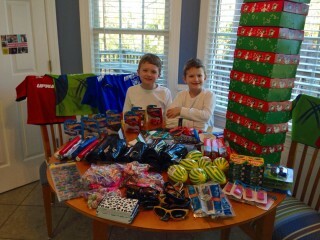 We had our shoeboxes packed with things such as toothbrushes, toothpaste, candy (to offset the toothbrush), shin guards, a small football, a note pad, pens, pencils, socks, sunglasses, washcloths, soap, jump ropes, crayons, matchbox cars, pencil sharpeners, erasers, and, of course, the prized jersey. Once everything was packed, we prayed for the boys who would receive the shoeboxes, and we prayed for the safe travels of those transporting the shoeboxes to Camp Arbat. Syrian refugee children have seen far too much violence in their lives already. 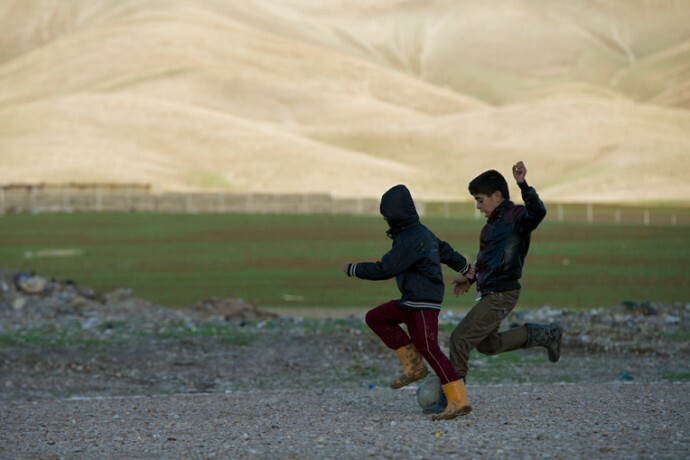 Playing soccer gives them an opportunity for recreation and friendship like normal children. Monday morning, we raced off to FedEx to initiate the shipment, and on Tuesday morning I got the message that the boxes had been delivered to our Samaritan’s Purse contact. He called me later that evening and let me know that he had already stowed them in his gear for the trip to Camp Arbat. The shoeboxes may have been the world’s quickest mission effort, but as we learned with our previous gift, there is no such thing as a small gift when done in the name of Jesus Christ. Dare we say mission accomplished?